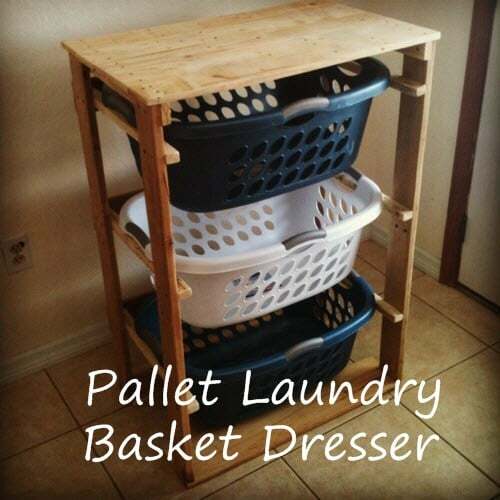 A laundry basket organizer is a clever way to use store bought laundry baskets in an easily constructed organizer that can be made from reclaimed pallet wood (or boards from an alternate source, if needed). The supply list is comprised of items you would expect in a project of this type (screws, measuring tape, square, pencil, safety glasses, drill, circular saw, etc.). Additionally, the tutorial is presented in a clear manner that shows the step-by-step directions (with detailed dimension information) that allow you to make a great organizer that will house your laundry baskets drawers. The entire project is easy to create and offers versatile storage space for just about every room.